Marcus Pointe Christian Academy strives to provide a solid educational foundation within a Christian framework. We believe in our mission to connect traditional education to a web-based world as we bring our students the latest technology while grounding all we do in the teachings of Christ. MPCA challenges students to examine and embrace the Christian walk through a personal relationship with Jesus Christ. We encourage our students to be academically articulate, knowledgeable, accountable, and to live with purpose to affect a difference in the world for the glory of God. We believe that the Bible is the infallible, divinely inspired Word of God and the basis of all truth. 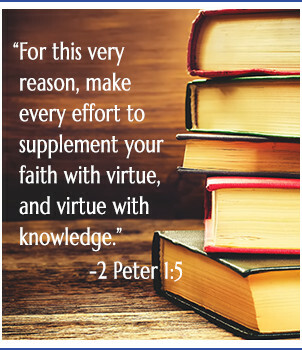 Therefore, in order to teach the truth in any academic discipline, we will base that truth and the expectations on what God has to say about it in His Word. We Believe: there is one God, eternally existent in three persons—Father, Son, and Holy Ghost. We Believe: in the deity of Christ, His sinless life, His miracles, His vicarious and atoning death, His resurrection, His ascension to the right hand of the Father, and His personal return in power and glory. We Believe: in the absolute necessity of regeneration by the Holy Spirit for salvation because of the exceeding sinfulness of human nature, and that men are justified on the single ground of faith in the shed blood of Christ, and that by God’s grace alone are we saved. We Believe: in the resurrection of both the saved and the lost; they that are saved to the resurrection of life, and they that are lost to the resurrection of damnation. We Believe: in the present ministry of the Holy Spirit, by indwelling, the Christian is enabled to live a godly life. MPCA Worldwide exists to connect students at home and around the world with the academically excellent, Christ-centered quality education provided at Marcus Point Christian School through online learning.